How to Fix those Rounded Shoulders! If you have rounded shoulders and want to stand up straight then read on! What I didn’t realize as I got older was that some people really consciously think about standing up straight but can’t. So, it’s not that they don’t want to pull their shoulders back. What people don’t realize is that the muscles of the core and back won’t allow them to because they are too weak to support better posture. One quick tip to stand up straight and fix those rounded shoulders in a hurry is to lift your chest high! Create space between the ribs and hips and just lift your breastbone. Can you stay that way all day? Probably not. So, where does the strength come from to help us stand up straight and with good posture? The best place to start is with posture exercises that focus on the core or abdominal area and the muscles of the upper and middle back. Your “core” helps to support your spine in an upright position. When the core muscles are weak the spine collapses and you end up slouching. The best way to work the core or abdominal region is with Pilates exercises found in the new ebook available here! Start with some easy exercises such as the pelvic lifts or bridges and then progress to the crisscross and side planks that can be found in the bonus ebook free, with an order of the Pilates ebook. Rounded shoulders can occur when the muscles of the upper and middle back are weak and the chest is tight pulling the shoulders forward. This can lead to a condition known as Kyphosis or "Hunchback". Find out more about kyphosis exercise in this article. To offset this muscle imbalance work to strengthen the muscles of the back with pulling exercises like lateral rowing, shoulder rotation exercises, and lat pull downs. The muscles in the chest need to be stretched. You can do this by reaching your arms behind you, clasping them if you are able and lifting your chest as you stretch. See my favorite upper back stretching exercise here. Another of my favorites is using a stretch band to stretch the muscles of the chest while simultaneously strengthening the muscles of the upper back and shoulders. This shoulder exercise can be done by following the picture to the right. Lying or standing with an end of the stretch band in each hand and your arms long pull your arms apart by drawing your shoulder blades towards the spine. As you bring the band across your chest you will feel the stretch there and the work in your back between the shoulder blades. 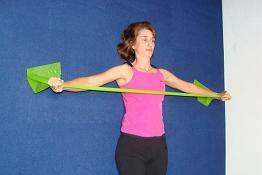 Do this rounded shoulder exercise up to 15 repetitions a day lying or standing. Fix those rounded shoulders with some of the free shoulder exercises and articles found here! Doing these stretches and strength exercises on a consistent basis can help you gain inches in height and look years younger just by improving your posture! 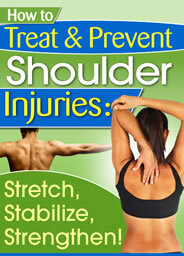 Check Out Our Favorite Recommended Ebook to Treat and Prevent Shoulder Pain and Injuries! Get Instant Access to Loads of Color Pictures, Exercises, and Information Designed to Heal and Protect your Shoulders. Learn how to Heal and Protect your Shoulders so you can Enjoy Life Again!